Welcome to the New Chrysler K-Car Club. Our club is dedicated to the preservation and restoration of all Chrysler K-Cars from 1981 to 1989. 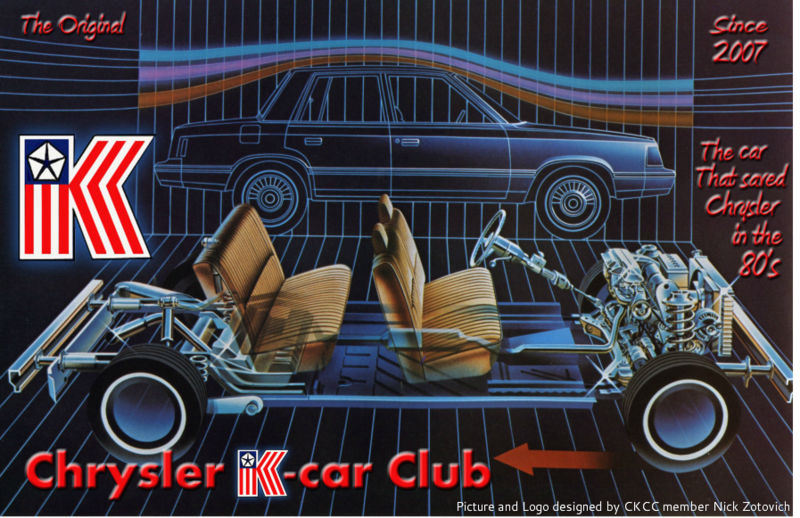 The Old CKCC was formed in Feb 2007 for the express purpose of encouraging K-Car enthusiasts to band together for mutual interests in the preservation, restoration and enjoyment of Chrysler K-Cars. This club is not affiliated in any way with the Chrysler Corporation and is a not-for-profit organization. The club has been through some major challenges in that we just did not have the ability to service our people as well as we would have liked. The original webpage was designed by Charles A. Coulombe. The new club page has been developed by Bernadette Coulombe to help us adapt to a time of new social networking, provide better service, and of course provide a place for people to have fun and enjoy the last of the Ks. The new social network site has been developed by Charles. The Mexican K-Cars, i.e. Dart K, Volare K, Valiant K, Magnum K, Magnum 400, Magnum 600, LeBaron, New Yorker, etc. The Canadian 1983-1985 Plymouth Caravelle Coupe/Sedan and 83 limo is extinct now, unless you have the last one we don’t know about. Two Canadian 86 Caravelle Coupes belong to the club. WHY SHOULD YOU JOIN THE CKCC. READ BELOW! You should consider joining our car club, K-car owner or not, and here is why! To keep your car running of course! Our mission is to save the 1980s classic K-car. We take this very seriously as the pre-1985 hardtops are almost extinct now. Our mission is assisting you through seller assistance, repair assistance, car shows, and an online social networking site. We need donations, and that’s just to keep our non-profit club running. We also need your help and skills. We need people to help out at the networking site. Tragically, some models of the K-cars have now been almost wiped out totally. The Canadian Caravelle for 83-84 is now the first extinct K-car, including the 83 limo. This is because people of the current generation are not stopping to think about the historically significant classic cars they are destroying, even if the car was in the family for a generation. Mint examples are still getting clunked. Part of this is due to our devastated economy. Out of the three million cars produced, only an estimated 40,000 or so are still on the roads today, mostly post 85 models and convertibles. There are more convertibles then sedans now. For pre 85 hardtop models, the surviving cars are really only around a few thousand nationwide. By 2013, all of these cars will have hit the 25 year mark and be eligible for membership in the Antique Auto Club of America. Lets hope we can keep the early ones around for 2020. This is the car that saved Chrysler from bankruptcy and they were more than just an economy car. They were luxury economy cars with classic styling and good gas mileage. They were available in every single body style, even a limo, and provided excellent service. They were classed as a midsize even though they were a compact. They had the roominess of a Cadillac, but were four bangers. They were the first cars in American history to provide four cylinder turbo charging and they provided the platform for nearly every other American Chrysler car of the 80s into the early 90s, including the first Chrysler minivan. These cars presented the first digital technology and the Electronic Voice Alert System. They were the last Chryslers that were easy to service and could be worked on by the do-it-yourself mechanic. How foolish many are to so quickly junk these cars without a 2nd thought. They had classic lines, fine luxury, fuel efficient engines, front-wheel drive, and are a pleasure to drive. So, if you are a serious Mopar enthusiast that owns a K-car, or not, please come join our club today and help us keep the K-car alive. If you are having problems with your K-car or have to get rid of it, please join our club for seller and repair assistance so we can explore logical choices before a decision regarding the car has to be made. And, that decision which has made our job so difficult is simply this. It is destroying a significant car at the drop of a hat. There are many government programs in place today making our job more difficult, because they entice people to abandon the ownership of old cars entirely. So far, they have almost succeeded and continue to find ways to make more money. Please do not fall for these ploys, or at least try another option first. Join the CKCC today. We also have fun by the way. We are the only organized group in the world that takes K-cars to events and car shows. Los Angeles has a very active chapter. That for me as your president is the biggest reward of building this organization. We are 5 years old and have 1,500 members. We have had over 12 major car events to date. Also, K-car prices are finally increasing. Convertibles are worth as much as $5000 now.